The National Women's History Museum recently conducted a survey to gauge how well Americans understand women's history and the nation's preeminent heroines. The survey was conducted to build a case for why a museum dedicated to women's history is needed. Joan Wages, President and CEO of the National Women's History Museum, has shared the survey results, which indicated that a place where the nation's female role models can be illuminated is desperately needed. The survey found that only one in four respondents were familiar with major female historical figures like Elizabeth Blackwell, Ida B. Wells-Barnett and Sybil Ludington and less than one percent of respondents knew how many women currently serve in Congress or how many women are CEOs of Fortune 500 companies. Also, a third of millennials surveyed believe they are knowledgeable about women's history and just 10 percent of adults over age 55 feel the same way. The backlog of commercial and industrial construction projects reached 10.3 months in the South, the highest reading in the history of the Construction Backlog Indicator (CBI), according to third-quarter results announced by Associated Builders and Contractors (ABC). Nationally, CBI remained virtually unchanged at 8.5 for the quarter, although it has declined by 3.5 percent year-over-year, indicating that the nonresidential construction backlog has stabilized at a high level. "Nonresidential construction remains one of the nation's leading engines of economic growth," said ABC Chief Economist Anirban Basu. "Industry spending is up 11 percent on a year-over-year basis, and the most recent backlog indicator strongly suggests that construction volumes will continue to recover. Unlike prior years, both the private and public sectors are now contributing to spending growth. "While rapid economic growth continues to elude America, the economy has been strong enough to produce more than 2.6 million net new jobs over the past year," said Basu. "Wage growth is poised to accelerate and residential markets continue to improve, with single family activity picking up recently and home prices continuing to edge higher in many communities. This implies ongoing support for commercial construction and stable tax collections or better, which ultimately translates into more public works projects." The South continues to be associated with large-scale projects that help drive the construction backlog higher. After a lull in backlog growth, many Louisiana contractors are indicating a surge in backlog associated with industrial projects. Commercial activity in Florida continues to expand in virtually every major city. Despite a loss of momentum in energy-related investment, backlog in the Middle states continues to be supported by a host of other segments, including large-scale distribution centers, capital investment in automobile factories, and significant levels of healthcare- and medical research-related investment, including in cities like Grand Rapids. The Northeast boasts the second highest CBI reading after the South, with public spending increasingly supporting activity in states like Maryland and Pennsylvania. Technology companies continue to expand their physical footprint and to generate profound levels of new wealth. As a result, backlog in the West has expanded briskly over the past two quarters and is now approaching 8 months. A private development firm has been selected to design and build the Loop 202 South Mountain Freeway, the state's largest highway project ever to be constructed. ADOT selected Connect 202 Partners, a group composed of four multinational development companies, who will construct 22 new miles of freeway scheduled to begin this summer. The group includes Texas-based Fluor Enterprises, California-based Granite Construction, Minnesota-based Ames Construction and Canada-based Parsons Brinckeroff. Construction will take about four years and will link Interstate 10 near Chandler and Ahwatukee Foothills with I-10 in the West Valley, allowing traffic to bypass downtown Phoenix. The State Route 99 tunneling machine entered its next phase of testing recently near Pier 48, moving forward and installing a tunnel ring at the bottom of the 120-foot-deep pit crews built to access and repair the machine. Seattle Tunnel Partners, the Washington State Department of Transportation's design-build contractor for the tunnel project, plans to tunnel a short distance further in the access pit tunnel before giving crews a break for the holidays. In 2016, STP plans to mine out of the access pit toward a planned maintenance stop 450 feet to the north. Along the way crews will mine slowly while installing tunnel rings and continuing to run tests. When the machine reaches the maintenance stop, essentially an underground block of concrete just south of Colman Dock. crews will perform maintenance and make final adjustments before diving beneath the viaduct. The California Department of Transportation (Caltrans) is seeking entries for its 2016 Caltrans Excellence in Transportation (EIT) Awards Program. Now in its 30th year, the EIT Awards rogram honors the best of California's transportation projects from across the State. The Caltrans EIT Awards Program is open to Caltrans districts, local and public transportation agencies, and private engineering and consulting firms. Transportation improvements or projects currently in use and completed since January 1, 2013, are eligible. The entry deadline is Monday, January 18, 2016. Guidelines, and all forms necessary to apply, are available on Caltrans' website at www.dot.ca.gov/awards. 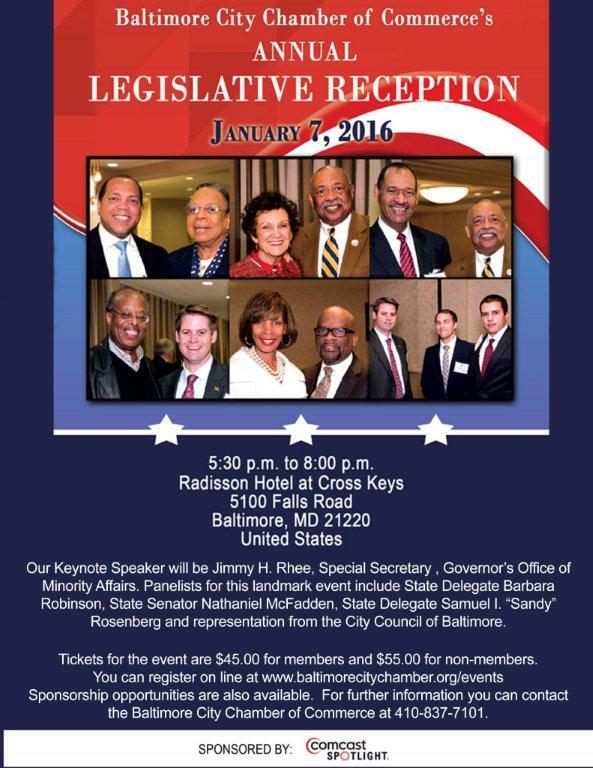 Thursday, January 7, 2016, 5:30 p.m.–8:00 p.m.
Members and associates of the Baltimore City Chamber of Commerce along with the Baltimore City business community will meet to welcome and discuss issues of concern to the business community.